Usually summer and fall, sometimes spring. Lawns, gravel roads, disturbed sites. This is a common and widespread mushroom easily recognized by it’s shape and it’s shaggy, dissolving cap. It is one of the “Foolproof Four”, the four most easily identified mushrooms. It is found either singly or in clusters, lines, or rings. It obtains its nutrients from decaying organic matter (saprobic). It usually appears in the summer and fall, but may also appear in the spring. The cap when young is whitish with a brownish center, smooth, and dry. It is oval to cylinder-shaped, 2″ to 5½″ tall, and 1″ to 2″ wide, covering most of the stalk. As it matures it becomes bell-shaped with spreading and uplifted margins and large, shaggy scales. As it ages the margins dissolve progressively upward into black ink at that drips to the ground. The entire cap dissolves in a little as 24 hours. The gills are white, closely spaced, and are not attached to the stalk. As they mature they quickly turn pink then black. As they release their spores they self-digest, turning into black ink at that drips to the ground. The stalk is white, smooth, hollow, usually 2″ to 6″ tall, and ⅜″ to ⅝″ wide. Large individuals may be up to 8″ tall and ¾″ wide. At the base of the stalk is a slightly bulbous, cup-like structure (volva). This is a remnant of a protective, egg-like covering (universal veil) that completely envelopes the developing mushroom when young. It may be partially or completely buried in the ground. It adheres tightly to the stem and is not sack-like. Toward the top of the stalk, below the cap and gills, is a membranous ring. This is the remnant of a protective covering (inner veil) of the developing gills. It has a mild, pleasant odor when young. Lawyers Cap mushroom at Black Dog Fen. The stem part alone is about 8 or 9 inches long - top to bottom the thing was easily a foot high. The "Shaggy Mane" is one of the easiest mushrooms to safely identify. Just don't try to keep them too long or you'll end up with an inky mess. Shaggy Mane - Common and easy to identify. Often growing in clusters with individuals up to 11 cm in height. Photographed at Grand Forks, North Dakota (25 September 2010). 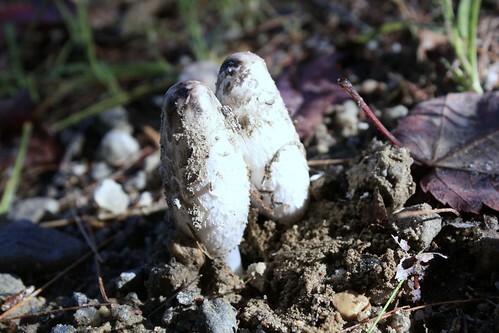 Cogumelos da espécie "Coprinus comatus" em processo de autodigestão. Em 48 horas, deliquescem em uma tinta preta. Por isso são chamados de "ink caps" (chapéus de tinta). São comestíveis, mas é bom esquentar a frigideira antes de colhê-los, como diz a expressão popular. As fotos foram coletadas por uma webcam, usando um programa que fiz em Pure Data. O vídeo bruto foi renderizado com o software gratuito Photolapse.